Great Value. 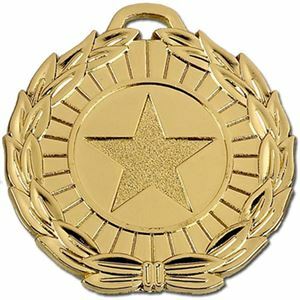 The outer edge of the Mega Star Medal is beautifully die-cast in the shape of the embossed laurel wreath and the centre is embossed with a textures star which can be kept as it is or replaced with your logo. Alternatively, you can choose from our huge selection of FREE printed insert images. The 50mm and 70mm have an embossed sun ray surrounding the logo insert. 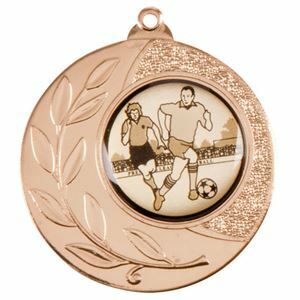 The metal medal is finished in a shiny gold or silver, while the bronze is finished in an antique bronze. Great price. A chevron pattern is embossed on the outer edge and small embossed stars decorate the surround of the VF Star Medal. The centre has an embossed star which can be replaced by your logo or left as it is. Alternatively, you can choose from our huge selection of FREE printed insert images. Excellent price. The VF50 Tudor Rose Medal is cast in the classical shape of the English Tudor Rose with detailed embossed grooving on the petals. 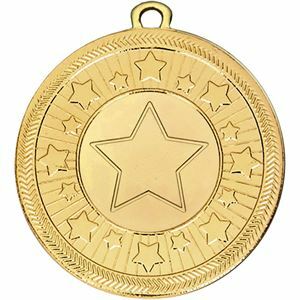 The medal has an embossed star in the centre which can kept as it is or the centre can be personalised with your team or club logo. Alternatively, you can choose from our huge selection of FREE printed insert images. One of our best buys. The Titan Medal is decoratively embossed with laurel leaves to the left of the blank centre and has a textured embossed design to the right. The blank circular centre allows you to include your club or team logo. Alternatively, you can choose from our huge stock collection of FREE printed insert images. Offered at an excellent price. A beautifully die-cast heart has an inner medal which is decorated with a grooved trim. 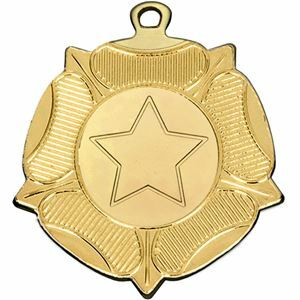 The outer edges of the Economy Heart Medal, are then embossed with decorative laurel leaves and the centre is blank for you to include your logo. Alternatively, you can choose from our huge stock collection of FREE printed insert images. Great value buy. The surround of the Warrior Medal is embossed with a vector pattern on a textured backdrop. 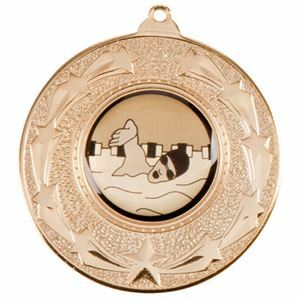 This medal has a blank circular centre for you to apply your club or team logo. Alternatively, you can choose from our huge stock collection of FREE printed insert images. Great value. 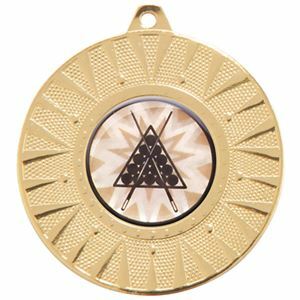 The Star Force Medal is embossed with a star, chevron and groove pattern on the surround and has a blank centre for you to include your club or team logo. Alternatively, you can choose from our huge stock collection of FREE printed insert images. 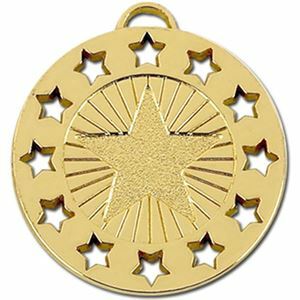 The Starburst Medal is embossed with a ring of shooting stars on a textured surround. Offered at a great price. 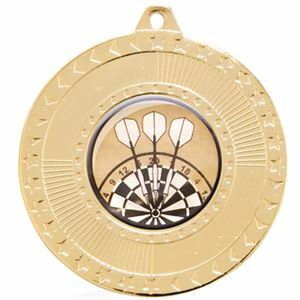 The medal has a blank circular centre for you to include your club or team logo. Alternatively, you can choose from our huge stock collection of FREE printed insert images. 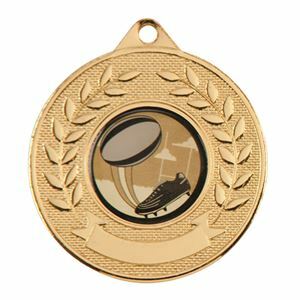 The Cyclone Medal is embossed with a stylised spiral angular design and has a blank centre allowing you to personalise the medal with your club or team logo. Alternatively, you can choose from our huge stock collection of FREE printed insert images. Great value offer. Great Value. The Valour Medal is decoratively embossed with a laurel wreath and a banner on a textured surround. 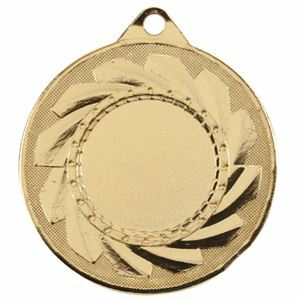 This medal has a blank circular centre for you to personalise by including your club or team logo. Alternatively, you can choose from our huge stock collection of FREE printed insert images.